Appointments made in response to company growth across all divisions. Maumee, OH, January 22, 2018 – Aktion Associates, Inc., a national business consulting and technology solution provider, announced today the appointment of three new Division Vice Presidents. Steve Handly is Vice President of the Construction & Real Estate Division, Bob Lindeberg is Vice President of the Supply Chain Division and Steve Rogers is Vice President of the Technology Division. The appointments were made in response to Aktion’s continued growth and to improve alignment of internal resources with target industries. “2017 was an outstanding year for Aktion, our most profitable year ever in our nearly 40 year history,” said Scott Irwin, CEO, Aktion Associates. “I knew we needed to restructure our organization and identify division VPs to lead the vertical-specific teams. With this new structure, we’re well-positioned to meet our double digit revenue and profit growth objectives,” Irwin added. Aktion Associates Construction & Real Estate Division delivers applications and solutions to the Construction industry including Sage 100 Contractor, Sage 300 Construction & Real Estate, Sage Estimating and Sage Construction Project Center. The Supply Chain Division delivers applications and solutions to Wholesale Distributors and Discrete Manufacturers including Infor CloudSuite Distribution and Acumatica Cloud ERP. The Technology Division delivers Cloud and Managed Services; Mobile, Analytics, Networking and Security solutions, and infrastructure technology including servers, storage and systems. 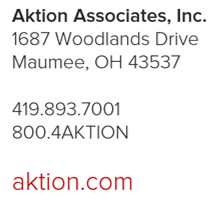 In business since 1979, Aktion Associates Inc., is a national consulting firm that delivers industry-specific applications, Cloud and Managed Services, infrastructure and next generation technology solutions. Aktion partners with technology innovators including IBM, HPe, Cisco and Microsoft to deliver a complete technology solution. More than 4,500 clients reward us with their partnership and choose Aktion as their technology advisor. Visit www.aktion.com, follow us on Twitter @AktionFigures and connect with us on LinkedIn.